Published on diyaudio, by CLS. The midhorn is an Oris 150 by BD-Design, in this case not used with fullrange drivers, but with a focal midrange driver. This system really struck me, because it's an interesting combination between a few things. First of all, I am a fan of the Oris-style tractrix/fullrange approach to midrange. I have been sold since hearing various Oris systems at the BD-Design showroom and in private homes. A hornloaded fullrange driver gives an excellent overall combination of range, dynamics, resolution and easily achievable coherence. The compressiondriver loaded Oris horn takes it a step further, but the price reflects that as well. I don't have the budget for real Oris horns at the moment, but I have been able to get at least some of the magic with DIY horns, which is proof-of-concept to me. Clearly, the maker of the featured system took a different approach and uses separate midrange and treble drivers, which is fine too. In general, the directional nature of a tractrix horn reduces negative room interactions in a domestic environment (less reflections off side walls), which is useful. Next is the dipole section. Dipoles are very hot for bass at the moment, partly because they excite roommodes less. The front and rear waves are out of phase, they meet at the edge of the baffle and cancel each other out. 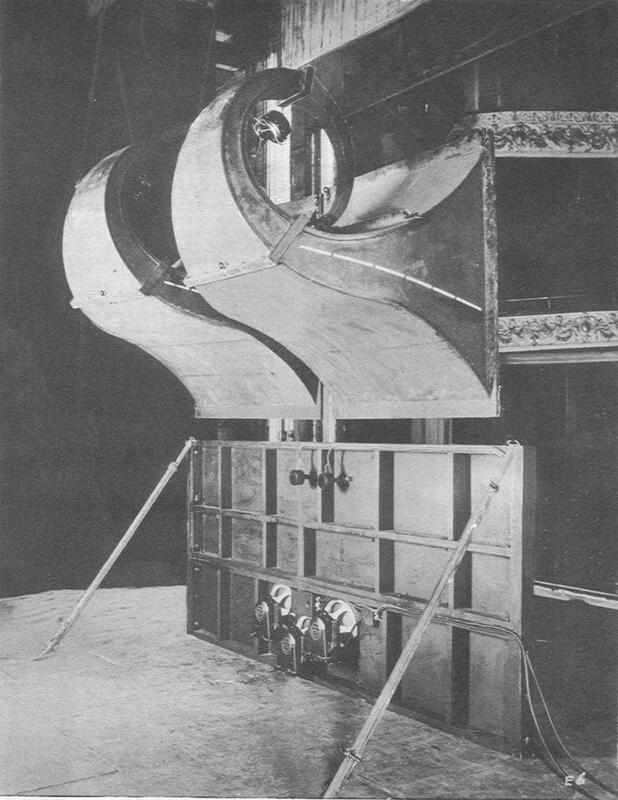 In a normal box speaker, the sound is radiated in all directions, but in an open baffle speaker the radiation towards the sides is much reduced. With less sound going into your room, there is less chance of room resonances and other room interactions. Dipoles are also much less efficient than basshorns or box speakers. Overall, people that use dipole bass seem to value the reduced room interaction more than efficiency. You can read more about dipoles at Linkwitz's site or, if you can read German, at dipol+. Also note that dipole is also used for midrange and treble applications and there are strong points to be made for that as well. Linkwitz is a particularly good source for that. In any case, considering midrange horns are appreciated for their reduced room interactions, and dipole bass sections are appreciated for their reduced room interactions, it seems logical to combine the two. 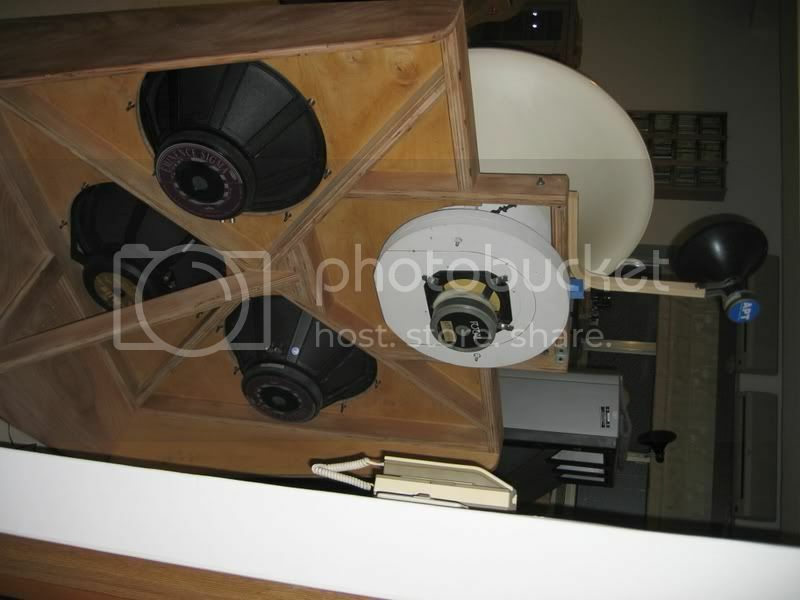 This full blown approach, with three 18" woofers per side, also seems to aim to "fix" the lower efficiency of the dipole section compared to the midrange and treble section. It's large (the television is 53", for reference), I wouldn't readily put it in my own living room, but I see the how and why behind the design. Finally, it reminded me a lot of the Western Electric theater horns with dipole bass sections. Their obvious strong point was the elaborate and finely designed HUGE midrange horn. Their obvious weak point is the extreme time delay caused by the very long midrange horn. 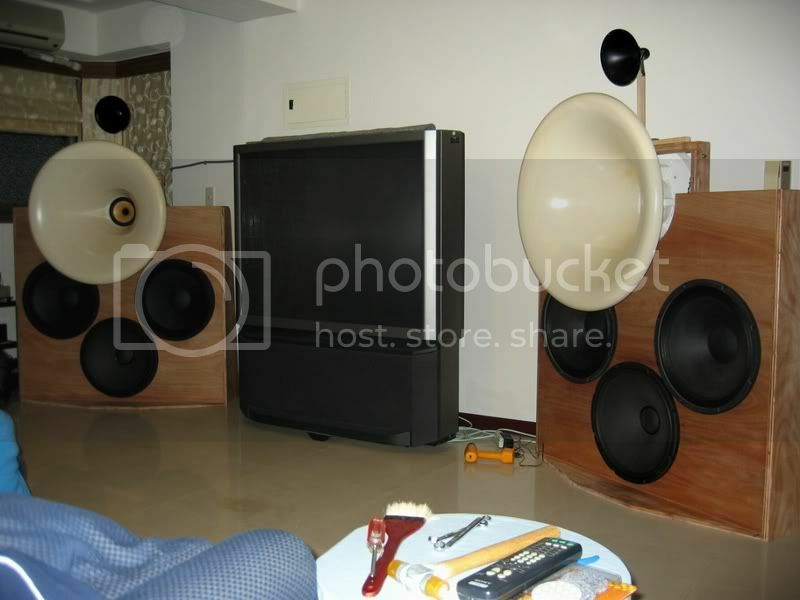 The added path of the soundwaves makes them arrive much later at the listener's ears than the soundwaves from the woofer. According to the Lansing Heritage website (also the source of the image), the delay issue was so serious, that the click sounds from tap dancing could be heard twice; once from the woofer and once from the midrange horn! The featured system is a nice iteration of the Western Electric style system. It features a midrange horn with a fairly low cutoff, mated with a dipole bass section, without the tremendous time delay. I'm glad you like my (previou) speakers. And it's a surprise when I saw my own work via google picture search.